1786 ~ 1831: he starts his career in minor theaters in Kamigata, playing under the name of Ichikawa Rikimatsu. He becomes disciple of the actor Ôtani Tomoemon II at an unknown date and receives the name of Ôtani Tomoji. 1st lunar month of 1832: Ôtani Tomoji takes the long-forgotten name of Shibazaki Rinzaemon III. 3rd lunar month of 1832: Rinzaemon plays at the Takeda no Shibai (Ôsaka) the roles of Yakushiji Jirozaemon, Yoichibê, Ono no Sadakurô, Horibe Yajibê, Kondô Genshirô and the servant Rin in the classic "Kanadehon Chûshingura", which is produced by Asao Momonosuke. 8th lunar month of 1832: Shibazaki Rinzaemon III takes the name of Asao Kuzaemon II. 4th ~ 6th lunar months of 1835: tour in Ise with Nakamura Utaemon III, Arashi Kichisaburô III and Nakayama Yoshio II. 6th lunar month of 1835: the play "Sesshû Gappô-ga-Tsuji", which was originally written for the puppet theater and staged in the 2nd lunar month of 1773, is adapted for Kabuki for the first time, in Kyôto at the Kitagawa no Shibai; Kuzaemon plays the role of Gappô [casting]. 8th ~ 11th lunar months of 1836: tour in Nagoya with Bandô Hikosaburô IV, Mimasu Gennosuke I and Nakayama Nanshi II; Kuzaemon plays the role of Motoemon in the drama "Katakiuchi Tengajaya-mura", which is staged in the precinct of the Seijuin Temple in the 9th lunar month. 1st lunar month of 1838: Kuzaemon plays at the Naka no Shibai the roles of Teraoka Heiemon, Yoichibê, Ono no Kudayû and Horibe Yajibê in the classic "Kanadehon Chûshingura". 1st lunar month of 1839: premiere at the Kado no Shibai of Nishizawa Ippô's drama "Keisei Hama no Masago"; Kuzaemon plays the roles of Kishida Minbu, Ishiba no Gorozô and Tsujiura Jûnai [casting]. 3rd lunar month of 1839: the play "Sesshû Gappô-ga-Tsuji" is staged for the first time in Ôsaka, at the Kado no Shibai; Kuzaemon plays the role of Gappô [casting]. 11th lunar month of 1839: Kuzaemon plays at the Ônishi no Shibai the roles of Adachi Tomokurô, Hanazono Mondo, Hanbei's mother and Iwajibei in the drama "Katakiuchi An'eiroku". 3rd lunar month of 1840: Kuzaemon plays at the Kado no Shibai the roles of Amakawaya Gihei and Ono no Kudayû in the classic "Kanadehon Chûshingura". 5th lunar month of 1840: Kuzaemon plays at the Kita-Shinchi no Shibai the roles of Gonshirô and Gappô in the drama "Hirakana Seisuiki" and "Sesshû Gappô-ga-Tsuji". 8th ~ 9th lunar months of 1840: Kuzaemon plays at the Naka no Shibai 4 roles, including Yokoyama Daizen, in the drama "Hime Kurabe Futaba Ezôji". 11th lunar month of 1840: Kuzaemon plays at the Kitagawa no Shibai in the dramas "Keisei Haru no Tori", "Gishinden Yomikiri Kôshaku", "Ishikiri Kajiwara" (Kuzaemon plays the old man Rokurôdayû) and "Heike Nyogo no Shima". 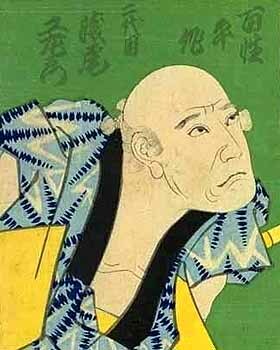 1st lunar month of 1841: Kuzaemon plays at the Naka no Shibai the roles of the shôya Fujiemon, the tedai Sôbê, Danjô and the gatekeeper Kiheiji in the drama "Keisei Yanagi Zakura". 11th lunar month of 1841: Kuzaemon plays at the Minamigawa no Shibai the role of Gonshirô in the drama "Hirakana Seisuiki". 1st lunar month of 1842: Kuzaemon's rank in the Kamigata hyôbanki, jitsuaku/katakiyaku section, is jô-jô-kichi (superior - superior - excellent). 9th lunar month of 1843 ~ Spring 1845: Kuzaemon settles in Edo and plays at the Ichimuraza. Summer 1845: Kuzaemon goes back to Ôsaka, falls ill and dies the 11th day of the 9th lunar month of 1845 (according to some chronicles, he died the 18th of the 6th lunar month instead of the 11th of the 9th lunar month). Asao Kuzaemon II was a good actor specialized in katakiyaku, oyajigata and fukeoyama roles but he did not find the same fame as Asao Kuzaemon I. He spent most of his career in Kamigata theaters and his last years in Edo.